But we said we were going to do it – we even advertised in the local paper. 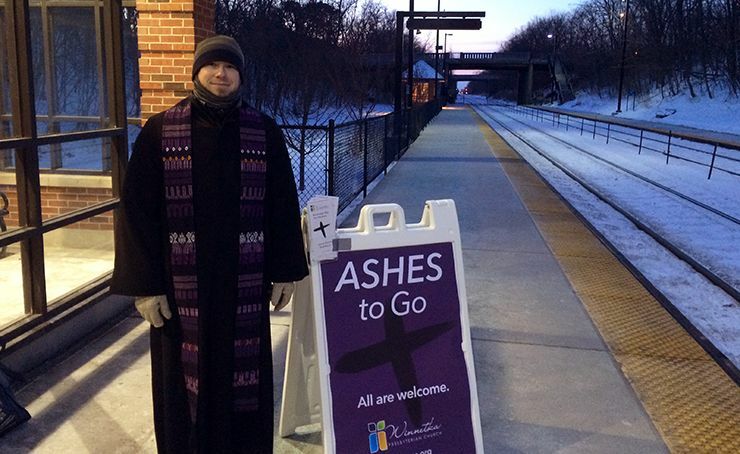 So my colleague and I met up at the Winnetka Metra station ready to give out Ashes to Go to anyone who wanted them. This was my first time doing anything like this – and I’m pretty sure it was the first time anyone had done Ashes to Go in Winnetka. I had heard about the idea a few years ago from some Episcopal church who offered “drive-thru ashes” and hoped I could do something similar one day. So we stood out in the frigid cold, and waited for commuters to come by. Now, the weather wasn’t great and didn’t create an atmosphere where people really just wanted to be standing around outside waiting. So, when the trains came, most people came by us pretty quickly. 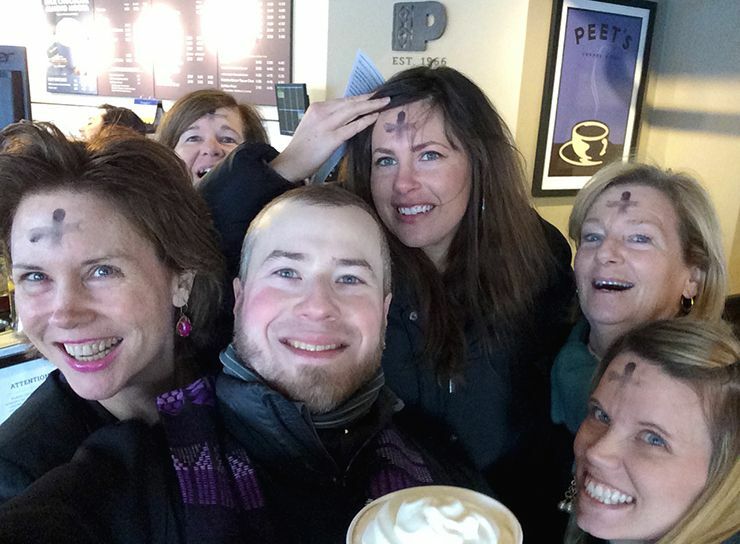 A few figured out that it was Ash Wednesday and decided to get their ashes from one of us, instead of tracking down a church downtown to get them. In the end, we probably gave about 10-15 people ashes at the 3 different train stations in Winnetka that we were at. Not quite the crowds I thought we would see, but that was okay. We had some good conversations with folks, and I am confident that more people are thinking about Winnetka Presbyterian than in the past. I was happy with that – but hoped to be able to get a bit more traffic, so I drove downtown and setup shop in front of the brand new Peet’s Coffee & Tea. I ended up standing outside of Peet’s for about 90 minutes. I had some people come by within the first few minutes, ask me what this was all about, and then ask to receive ashes. About 30 minutes in, a kind woman from inside Peet’s came out to get ashes and then bought me a cup of tea to help me get warm. A while later, after the wind continued to get worse, and continually knock over our sign..I decided it was about time to go home to warm up. And then a group of women started coming across the street, saying, “Wait a minute! Don’t leave yet…” Turns out a friend of theirs worked in an office across the street and had told them that someone was there giving out ashes. One of my favorite comments came from one of the women, when she said, “Uhhh, can I do this? I’m not even Catholic.” Of course, I told her that wasn’t going to be a problem, because I was also not Catholic. They got their ashes and then went into Peet’s to get me a mocha. We grabbed a few photos (unfortunately, I got my self-portrait monopod – what some might call a selfie-stick – a day late, otherwise it might be a better photo). 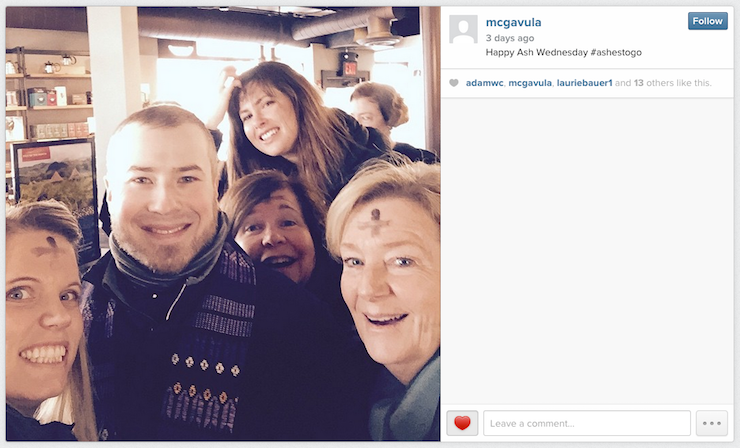 I mentioned the #AshesToGo hashtag, and turns out one of the women posted a photo on Instagram later that morning. Another great moment from that morning, was all the people who were coming up to say hi to me in Peet’s, and asking for ashes. 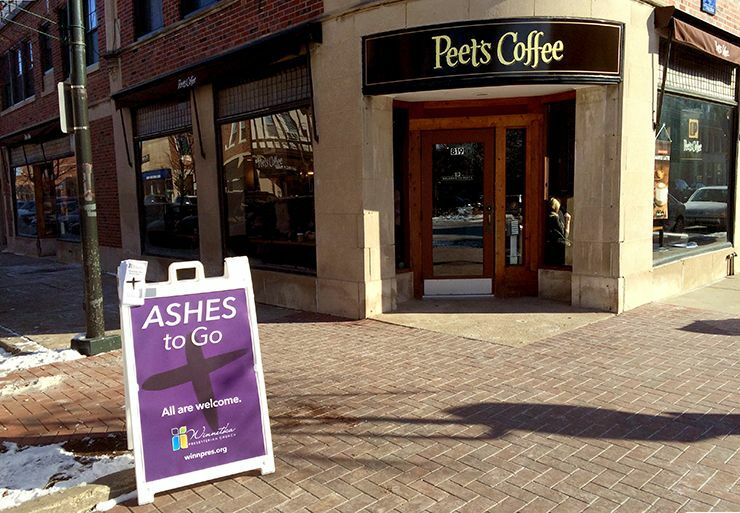 One person asked, ‘Ummm, do we have to go outside to receive the ashes?” I said, “certainly not” and just started giving out ashes right there in the middle of Peet’s to a small group of people. We even got featured in the Winnetka Talk, which is our local Winnetka version of the Chicago Tribune. You can view the article here. Location: As much as I thought the train stations were going to be good – I’m not sure that they work all that well up here in Winnetka. I’m sure the cold didn’t help, but there didn’t seem to be a ton of commuters there so early in the morning. Setting up in front of Peet’s or other coffee shops, or even grocery stores may be a much better option next year. Signs & Fliers: Having the large sign (pictured below) was very helpful, and I’m glad I invested the time and money into having something that helped us be noticed. We also designed fliers that shared some information about Ashes to Go and about Winnetka Presbyterian Church’s worship opportunities for Ash Wednesday and during Holy Week. I used a fair amount of the material from the Ashes to Go website here, which was really helpful. You can see our flier here. Tips for Carrying Ash: I carried our ash around in my pocket in one of these small humangear GoTubb containers. It worked really well, and the ash didn’t spill at all. Hand Warmers: If you’re in Chicago (or somewhere else that is really cold on Ash Wednesday), get hand warmers. 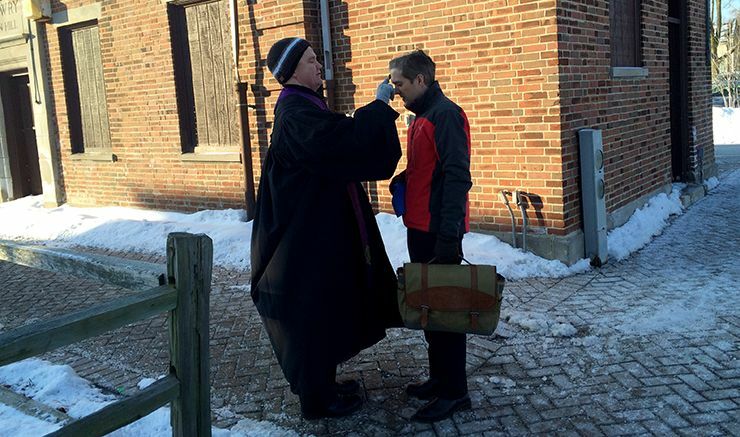 For the love of all things holy…get hand warmers. As I was reflecting on our Ashes to Go event with the local reporter, what struck me most significant was that we took this ritual outside of the church. We took our ashes out of the church. As much as we know that it really doesn’t work, when we (as church workers) sit around and talk about programs or new ideas, we still have a “Field of Dreams” mentality: if we build it, they will come. Now, sure that worked for Kevin Costner and Shoeless Joe Jackson, but that doesn’t work for the church in 2015 anymore. And so, with things like Tavern Talks and Ashes to Go, we are realizing that we can no longer just sit around and expect that people are going to come to us, the church. Rather, we need to take the message of love and grace out into the world. We have to go out into the public spaces, and find ways to communicate God’s love. I would argue that this is never about proselytizing – rather it is just creating safe, public spaces for people to gather together. I’m also not saying that a quick stop for ashes on the street corner is an appropriate or meaningful substitution for a communal Ash Wednesday Service in the evening. But I will say that those who stopped for ashes were probably touched to know that there is at least one church out there that gets how crazy and insane and busy their lives are, and wanted to take the time to step outside the church walls and find new and creative ways to communicate deep spiritual truths to people amidst their busy lives. I’m hoping that WPC’s Ashes to Go was able to communicate something like that.